My husband and I have had the same comforter set since just after we moved into our house back in 2003. Yes really that long. I alternate our bedding based on the temperature and season so it's not on there year round. But I have to say it really is time to make a change and update our bedding to a more modern style. I've got my eye on the Mia 8 piece Comforter Set from Lush Decor because it's modern, yet not flashy. I like our bedroom to be a calm environment and it already has muted colors for other decor. Plus I've always wanted decorative pillows, I don't know why I just think it would be neat to have. I'v also been eyeballing the Star 2 piece Quilt Set for my daughters bed because she's growing out of the princess bedding she has now and is also ready for an update. It would fit perfect with her room decor and her Dreamlights! Needless to say I'm loving their website and am ready to make some updates in all of our bedrooms. First new bedding, then new curtains! Buy it: Just for you I have an exclusive 10% off coupon code for any purchase from Lush Decor. Just use code LOVELUSH1 when checking out. Win it: One lucky reader will win a $200 gift card to Lush Decor. This giveaway will end February 1st at 12:00 AM EST. The winner will have 48 hours to respond to my email. If no response, a new winner will be chosen. Open to residents of the US. Many of the throws, pillows, and curtains are adorable! I would love to get the Serena comforter set. I would get the Flower Texture 8 piece Comforter Set! I would like to get the Royal Empire 3 piece Quilt. I would absolutely love to have the Serena comforter set. I really like the Lux 6-piece Comforter Set in the color Gray. Also, the Esme Shower Curtain is great. I love the Lux comforter set! It is so pretty and would go well in my master bedroom! I like the Royal Empire throw. I like the Ruffle Shower Curtain. I really like the Flower Drops Shower Curtain in red. I like the Boho Stripped Quilt. There is nothing better than to wrap up in a quilt on a cold winters night and we have been having a lot of those lately. I like the star 3 piece quilt. I would like to get the Lux 6 piece Comforter Set. I would choose the yellow Bianca 4 piece Comforter Set to buy from Lush Décor. Love the style a lot! I like the Flower Drops shower curtain in red. I love the Lux 6 piece Comforter Set ! I would love to win the Lux 6 piece Comforter Set in grey. This looks very sharp and would look nice with my white walls. I like the Lux 6 piece comforter set in grey. I would get the Lattice three piece quilt set in Slate for my daughter. So pretty. This Boho Three Stripe Quilt is adorable! Love the awesome bamboo fiber throws. I like the Aubree 3 piece Quilt set. I'd love to update my bedding. I would love to update the bedding in my guest room. If I won, I would choose the Avon 3 piece Comforter Set. I would love to have the Lucia 4 piece Comforter Set in brown. Its so pretty! I'd love to get the Adrianne 3-piece quilt set....very nice. I'd get the 3 pc star quilt in purple. I love the Darla Shower Curtain.. sooo pretty! i woudl love to get the red shower curtain with the flowers! I would love to have the ruffled shower curtain in the pinks and wines. I'd get the Dorein Shower Curtain. Thanks. I really like the Mia set you featured above, it's one of my favorites from the site. I also saw a couple others including one called Lydia that I liked and a nice throw called Monique that I thought was pretty. We recently bought a new home and I would really love to have a new bedset for our bed and a pretty new throw for the couch so thank you for the chance to win this great prize to buy some new stuff for my new home. I would love to get the Star Window Blackout Curtain (Pair) in navy. I love the Layla 3 piece quilt. It's so bright and beautiful! Ooh,the twinkle shower curtain is beautiful! courtafi2138 at gmail dot com. I love the Lux 6-piece Comforter Set in Gray. I would get the royal empire quilt set! I would get the Aubree 3 piece Quilt set! Its lovely! I would get the Glitter Sky 7 piece Comforter Set in red. I think I would get the Avery comforter set. I would get the chevron blackout curtains. I would get the Youth Star 3 piece Quilt in red for my son's room. I would love to get the Belle comforter set! I would like to get the Madelynn 3 Piece Comforter Set. We are currently remodeling and I'm in the redecorating mood since it's been 10+ years since I really changed anything in our home lol so I would totally be getting the Glitter Sky 7 piece Comforter Set in red/black! I love it so much and it fits my personal style perfectly! 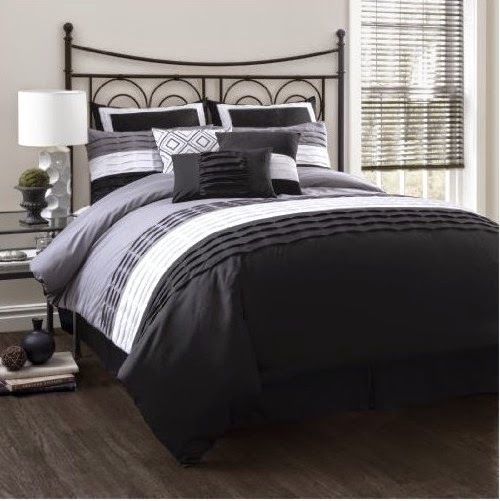 I would love to have the Lux 6 piece Comforter Set in gray! It would definitely go with my decor and my comforter is over 15 years old, so it's time for a new one! Oh I really love the Bianca 4 piece Comforter Set! So pretty! I'd love to get the Darla 4 Piece Comforter Set ! Lux 6 piece comforter set! Such pretty! Fingers crossed! I love your website, so much great content! Avery 7 piece comforter in white is so beautiful... I would buy that in King size. Yes I would. I love the Lucia comforter set in red. Perfect for Valentine's Day. The Mia 8 piece comforter set. I like the youths sea life quilt set and the lake como comforter set. I would like the Royal Empire 3 piece Quilt. I would choose the Rosemonde 5 piece Comforter Set. I'm rather fond of the Nora Quilt set. The warm colors just look so comfy to me and the price is great! I just love the Royal Empire 3 piece Quilt and the Adrianne 3 piece Quilt as well. Oh this is so hard! Probably the Polka Dot Blackout curtains or the Lucia comforter set. Everything on that site is so beautiful! ~ Danielle D.
I'd get the Royal Empire 3 piece quilt and the Royal Garden shower curtain. I would also love to get the Misha 3 Piece Quilt love the bright colors!! I'd love to get some throw pillows! I like the royal empire three piece quilt. I would love to get the Esme Shower Curtain for my guest bathroom! I really like the Darla Shower Curtain. I would get the Royal Empire 3 piece Quilt set. I like the Royal Empire throw.. I would like the Rosina Throw. I love the belle comforter set! I'd really like the Lux 6 piece Comforter set! So pretty! My bedroom could really use a makeover. It's been years since I've had new bedding! I would get shower curtains and bathmat or a comforter set. I'm not sure which yet. I'd get the Lux 6 piece Comforter Set in gray and some blackout curtains. I want the Royal Empire 3 piece Quilt in blue. I would love to get the Mia 8 piece bedroom set. I would love to add the Monica shower curtain to our bathroom. I would definitely buy the Royal Empire 3-piece quilt set in blue. We need a new shower curtain and they have some really beautiful ones. I would start there! They have so much to pick from! I choose the Serena 3 piece Comforter Set. I would pick out new sheet and comforter sets for my kid's beds. I would choose the Berlin 3 piece Quilt!